Remember when I used to do room updates all the time? I loved that. We’ve slowly been continuing to update our home room by room and now I have a plethora of updates to share with you. The first room I wanted to share was our Downstairs Guest Bathroom and share some tips for How to Update Your Guest Bathroom on a Budget. When we moved in, I hated that room. The color of the walls was some kind of puke, gold, brown color that was just gross. Let me show you what we started with in this bathroom. So once I got Tyler on the painting train he was kind enough to take care of this bathroom for me. So the first thing we did was paint the bathroom and get rid of the ugly color. We chose Repose Gray from Sherwin Williams which is quickly becoming my new favorite paint color. 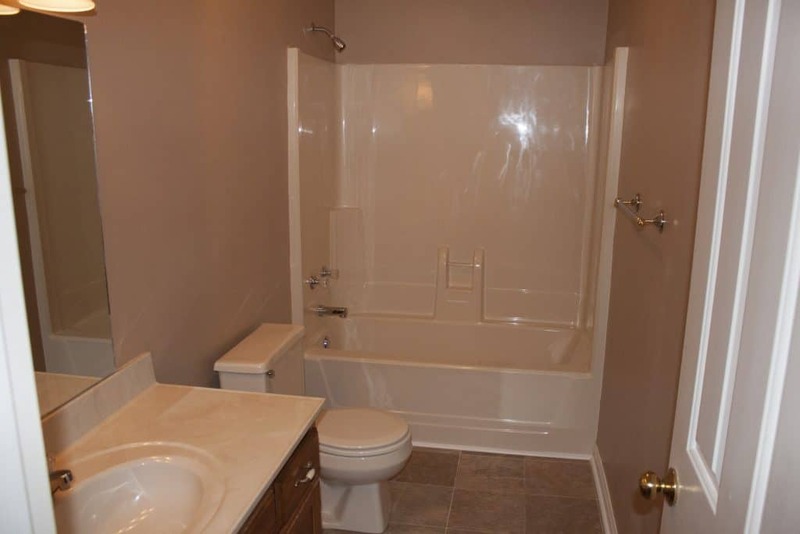 It’s the perfect gray color and it really helped brighten up the bathroom a little bit since it lacks any windows. One thing I will remember next time I house hunt, is more windows, more natural light. 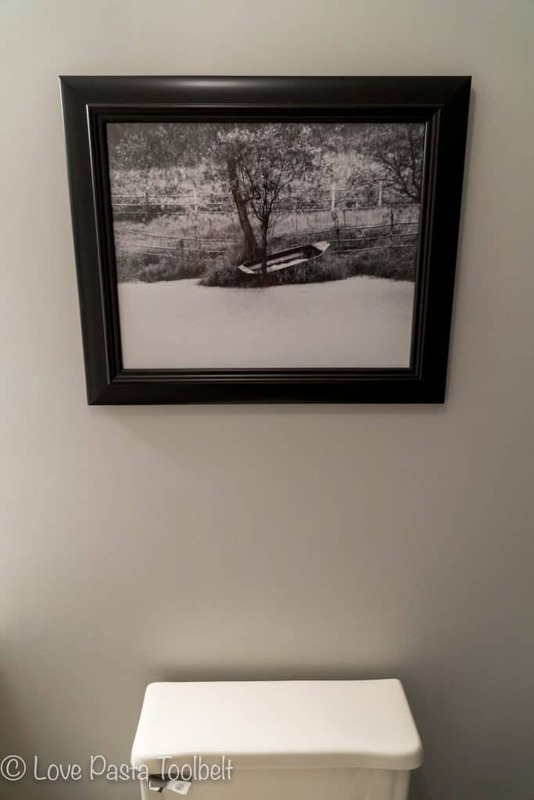 That’s something you can’t really change about a house. 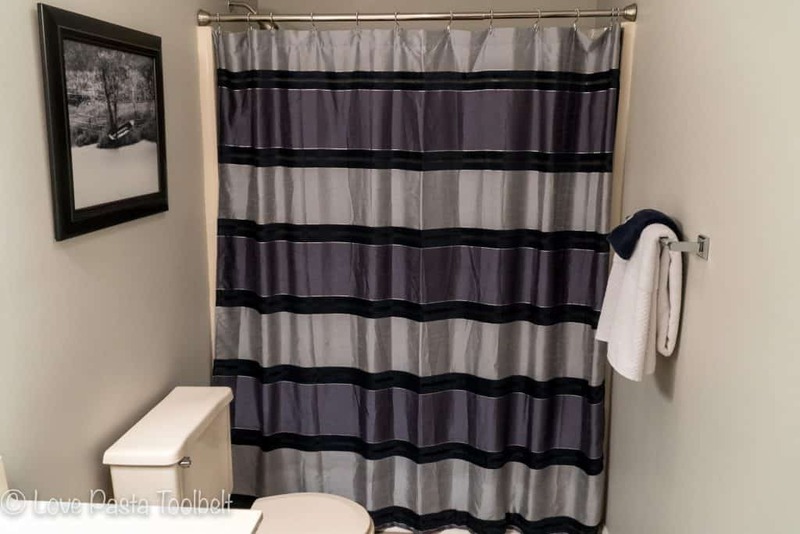 I knew that I had our navy and gray shower curtain from our previous master bathroom that would go perfectly with the Repose Gray walls. I can’t find it online but you can find a similar one that I also love here. 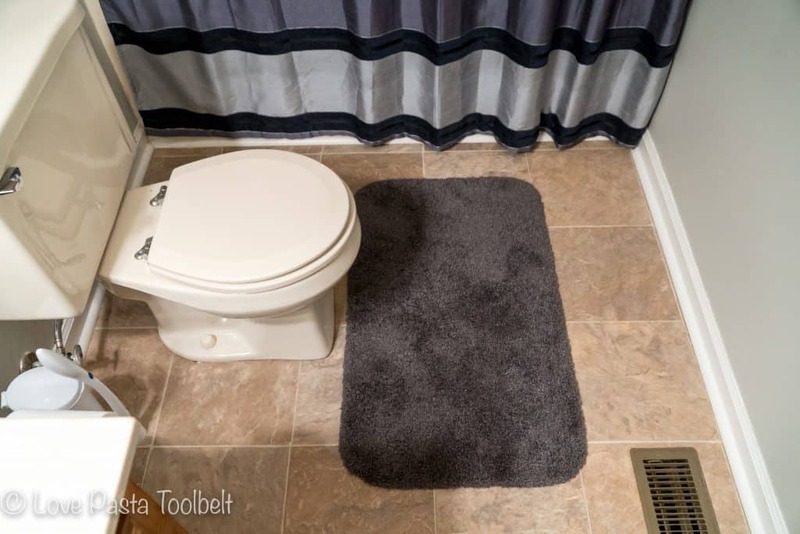 I added in a dark gray bath rug because the ones we had in there were old and tired. Here is a similar one to what I added that comes in so many different colors! Changing the paint color fortunately made the floors look better. It really is crazy how just changing paint color in a room can change how other things look. Before I hated the floors. While they aren’t my dream floors, they look a lot better now that the bathroom has a fresh and lighter color. 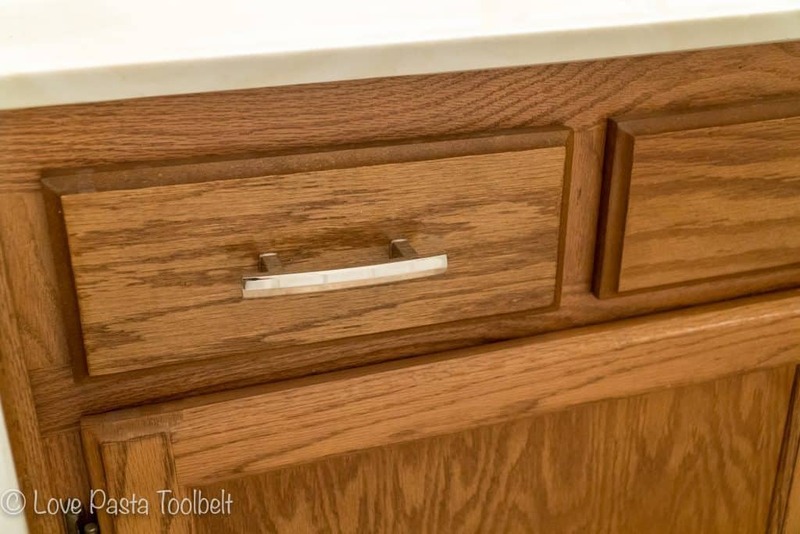 I’d love to replace the countertops ones day but that’s not high on my list of things to do in the house. 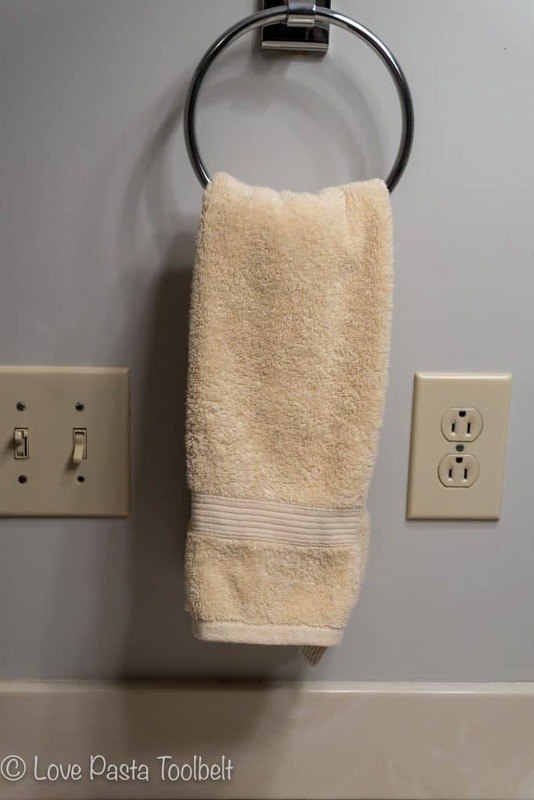 I’m just happy to have been able to make these few inexpensive changes that have made a big difference in this bathroom and it can all be accomplished in a weekend! One thing we have left to do is to find chrome switch plate covers. They didn’t have the ones we needed and honestly, I didn’t notice we still needed them until I was taking pictures of the bathroom so they’re something we’ll get next time we have a gift card to Home Depot or Lowe’s I’m sure. 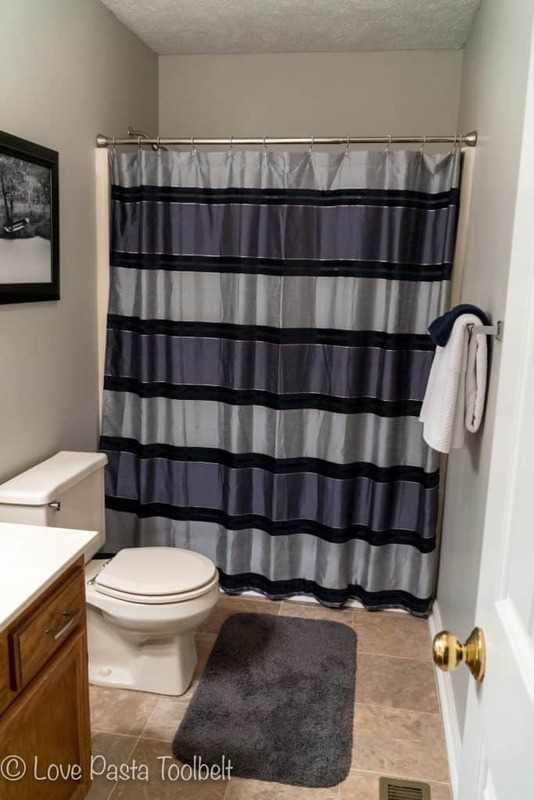 We made these few changes on a budget and were able to give this bathroom a fresh new look with little cost. We have more room updates coming to you soon, I am excited to share with you what we’ve done with our bonus room. It’s one of our favorite transformations in our house. What room is your favorite in your house?